9 Piece Trolls Dreamworks Fun Activity, Party Favor, Gift Set, Stocking Stuffer Bundle. 1 Trolls 4 Fun Page Sticker Book 5. 7" X 9. 5" 100+ Poppy & Friends Fun Stickers. 1 Trolls Trading Cards Featuring 7 Cards Each Of Your Favorite Trolls Characters Poppy, Branch, Cooper. 1 Trolls Pkg. Of 4 Mini Heart Stamps Featuring Cupcakes And Rainbows, Poppy & Branch. Any Child Who's Seen The Animated Trolls Movie Will Enjoy Playing The Part Of Poppy And Her Favorite Trolls Characters. 9 Piece Trolls Dreamworks Fun Activity, Party Favor, Gift Set, Stocking Stuffer Bundle. 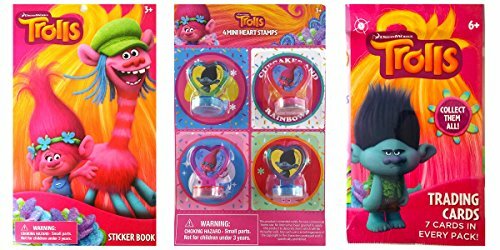 1 Trolls Trading Cards Featuring 7 Cards Each Of Your Favorite Trolls Characters Poppy, Branch. Collect Them All! Any Child Who's Seen The Animated Trolls Movie Will Enjoy Playing The Part Of Poppy And Her Favorite Trolls Characters.